Shaped like a regal crown, this striking eternity ring has been designed to fit perfectly above or below a solitaire engagement ring. The unique design also looks beautiful as a standalone piece thanks to a striking selection of diamonds. 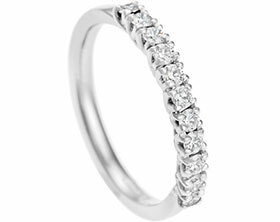 Five 1.5mm round brilliant cut G-H, VS1-2 diamonds have been set in a curved formation at the front of the band. The diamonds have a total weight of 0.07ct and have been grain set into delicate marquise shapes. The Fairtrade 9 carat rose gold band is 2mm in width and delicately tapers to emphasise the row of diamonds which are also further enhanced by a polished finish.